Caring is no substitute for actively trying to make a contribution to correct society’s ills — intolerance. Intolerance: anti-Semitism, bias, bigotry, bullying, discrimination, homomania, and racism are like tobacco products. There are no benefits, and they are both poisonous. Homophobia is the wrong word. I do not know anyone who is afraid of LGBTQs, do you? I do know many people who hate them. They are called cowards and homomaniacs. All men were not created equal in 1776. Women were not equal, nor did they have the right to vote until 1920. The author of the document, Thomas Jefferson, was smart and literate. If he and his members in Congress had wanted all people to be equal, he would have said it. But then, the poor, the workforce of slaves, women and indentured servants would have been considered citizens-people, human beings with rights. And that was not acceptable. But do not let us do what human beings are want to do, and that is to blame others for the mistakes we continue to make when it comes to intolerance. Just because the teacher did it, it does not mean the students must. Therefore, it was intentional that only wealthy males could vote. And women are still not considered equal today. Ask the sexual predators and the male-decision makers in our patriarchal society who make the laws to make sure women continue to be second-class citizens. Yes, it is a fact, some women have overcome and cracked the glass ceiling of repression. And more will succeed in doing so. Let us be dedicated to the millenials to take charge. and change the culture of intolerance in America. Another example is: why do we celebrate Columbus Day? 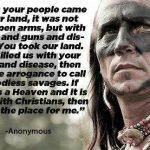 Columbus and his murderers were the worst of the worst genociders at the time. Depending on which historian you read, Columbus and his fellow genociders murdered, tortured, and worked to death four hundred thousand to one million of the native Arawak Indians in the West Indies. 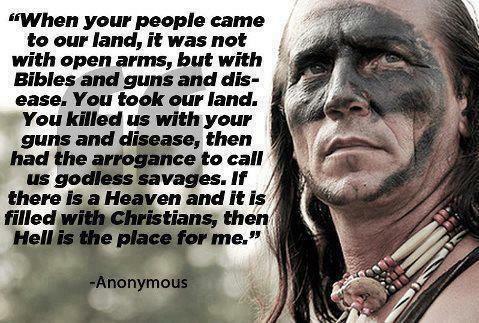 And, Columbus never arrived on the land of America. The only people who were recognized by the laws of the thirteen states to be equal were male landowners and rich male merchants. People in authority control and dictate our misconduct of intolerance. It is frustrating. I have compassion and empathy for the less fortunate among us. I cannot arrest the suffering worldwide of the hundreds of thousands of children, women, and men. People in power who make the decisions to cause this misery among the defenseless are called cowards, dictators and presidents. The helpless have no lobbyists to bribe the corrupticians who are the members of Congress, states’ governors, and states’ legislators to do the right thing. When these corrupticians need to pay for a financial benefit to their benefactors, who are standing in line to sell their souls to their backers, they take the funding from the defenseless to pay for the benefits for their benefactors. No one is without bias. It begins in the home, taught by the parents, and becomes more entrenched as the child ages. People may allow their intolerance to overtake their persona. During the recent presidential campaign, we witnessed with regret the performances of intolerance by the candidate, donald j. trump, t, (lower case letters used to show appropriate disrespect for the person not the office of the president), ranted and railed against everyone who was not like him. He is an effective-bad-role model, who has caused and continues to produce an escalation of intolerance in our society. The misconduct took place during his prejudicial-campaign speeches, and since he has taken office. The delusionals, cowards, now believe it is alright to engage in violent and degrading intolerant conduct toward the defenseless and in their absences. The rationale is: good enough for t, good enough for me. t never confronts in person. He waits until he leaves the company of his next victim before he defames her or him by using his addiction — Twitter or in a speech. The targets are never there because t is a weakling and without the courage to berate or castigate the persons face to face. An excellent example of this was his useless visit to China. After he left China and had accomplished nothing for the benefit of America, but maybe for him personally. Then, in his speech before the members of the Asia-Pacific Economic Cooperation, he accused China of illegal-trade practices. He is incorrigible. People in authority are influential regarding what people say and think. We have an unacceptable role model in t. People believe it is alright to emulate the hypocrite’s sixth-grade vocabulary, misspelled words in his Tweets, bad grammar, incomplete sentences, and his misconduct of intolerance. How do you know t is lying; he is talking. The same as Richard Nixon. The obligation to correct t’s role model must lie with the civic and community leaders, pastors, priests, other religious leaders, and all political leaders. We need every person in America to work together, to listen to one another, and give respect to people whom express a different opinion. As a member of the SY Inclusion Group, I do believe the members are dedicated with vigor to eradicate intolerance to the maximum of our abilities.